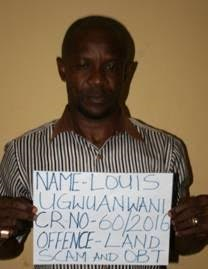 The Economic and Financial Crimes Commission (EFCC) has arraigned the duo of Ugwuanwani Louis and Enudu Kenneth before Hon. Justice Dugbo-Oghoghorie of Federal High Court sitting in Enugu on a two count charge bothering on land scam and obtaining by false pretenses. 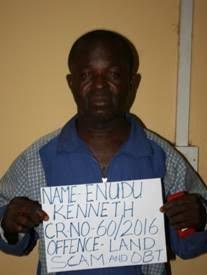 The arraignment followed a petition received by EFCC in January 2016 where It was alleged that sometimes around February 2012, Kenneth Enudu approached and informed the petitioner of a layout in Enugu called 'Ekulu North Pocket layout' whereupon the Luis was introduced to him as the seller and after much negotiations, the sum of One Million, Five Hundred Thousand Naira (N1,500,000.00) was paid to him for three plots of land.